This is my second post for today so make sure you check out my SUO Challenge post because it is based on the Card Set I did for Preview week. This is day two of Preview Week for Create with Connie and Mary Holiday Card “Create”tions and we have TWO…yep that TWO fabulous designers who are offering BLOG CANDY today! Who are they? Well…it’s very easy to find out! Head on over to Create with Connie and Mary and you will see their fabulous cards AND find the links to their websites! 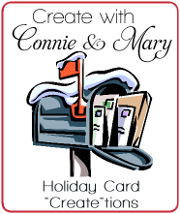 And while you are visiting the Create with Connie and Mary site…subscribe to our Holiday Card “Create”tions before the Early Bird special ends on Saturday! Natural Ivory – 3 3/4 x 5. Stamp the leaf in Crushed Curry, Cajun Craze, and Mossy Meadow. Add small Gold Basic Metal Buttons using Linen Thread. Add some Regals Candy dots to finish it off. Preview Week has begun and Create with Connie and Mary Holiday Card “Create”tions starts Sunday! This time we are doing an ALL CARD collection…how cool is that??? This entry was posted in Clean and Simple (CAS), Create with Connie and Mary, Holiday Mini and tagged For All Things. Bookmark the permalink.